Where an interior contains pull-out items such as drawers or pull-down rails etc, it is important, particularly on 3 door systems, that they are positioned in such a way that when a door is opened it will fully expose the item to be withdrawn. The drawers in (fig 1) will work OK, but if they were fitted a little further to the left on this three door wardrobe, they wouldn’t pull out. On interiors containing drawers and other pull-out accessories, consider installing the frame and doors first, marking the door overlap positions and the position of two doors pushed together on the same track, then remove the doors and proceed to fit the interior. Two, three, four & five door wardrobes can be supplied, and the most used door configurations are shown below. To estimate an approximate individual door width, take the finished opening system width i.e the (actual or intended) width after any framework has been fitted, add on 28mm (this is an average only), at each point where the doors overlap, and divide by the number of doors. Please note that overlaps vary from system to system, and an accurate dimension can be found on the relevant architectural specification page. The maximum door height (including tracks) on Series 700, 720 & 725 is 2500mm. On Series 640 the maximum door height (including tracks) is 2489mm. End panels, wall strips, intermediate panels and interior shelves etc, are supplied in the largest practical size and will need to be cut to fit the particular situation concerned. The components listed can be used to form the interior to match the clients storage needs. 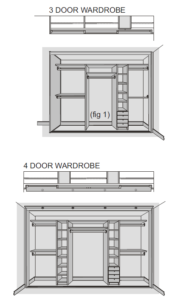 Sliding wardrobe interiors work best when they are compartmentalised so that one door will expose double or single hanging etc….use the layouts on these pages as a guide…try to keep shelves and rails to under 1000mm wide to avoid sagging. The interior carcase units are 2130mm high which is a convenient height for the top shelf and this allows 1065mm per section for the double hanging. Many different framing methods can be used, from a simple 135mm deep strip fixed directly to the wall(s) see (fig 1) up to a full scribe and return as in (fig 2). The wall strip can be bonded to the wall or attached with screws and caps. The disadvantage with this method is that the skirting needs to be removed. Whereas with the scribe & return method, the skirting can be scribed around! We recommend that a batten (minimum 100mm deep) is fixed to the floor and ceiling to provide a firm flat surface to attach the tracks to (see fig 2). The floor track batten also provides an edge to fit any new flooring up to. Floor to ceiling heights over approximately 2500mm will need a build down from the ceiling. One way of achieving this is by spanning 3″ x 2″ softwood between the side frames and cladding the face with a matching MFC panel (see fig 3). Whatever framing method is chosen, it is important that we are given the finished opening height and width (actual or predicted) and the doors and tracks will be made to fit these dimensions. Sliding systems available in the UK are mostly made for front frame situations, but because all Commonfield doors are made to measure, doors can be made to fit a full carcase equally well. Low voltage light systems can be used with Commonfield systems. To see how an intermediate panel can be used as an extended light pelmet to support the lights of your choice. We recommend that wardrobes are fitted at 660 – 670mm deep (overall) from the back wall to the front of the top track, this is considered to be an optimum depth for sliding wardrobes. The minimum depth should not be less than 610mm overall. Below this depth, normal use will be impaired. When measuring, it is important to ascertain the lowest floor to ceiling height. This will ensure that the doors fit and also allow the track battens to be packed out level.